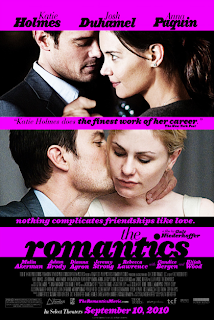 It's very My Best Friend's Wedding, but I have a feeling that The Romantics will bode well at the box office. The story is simple: seven friends reunite for the wedding of their friends. Problems arise because of the bride (Anna Paquin) and the maid of honor's (Katie Holmes) rivalry over the groom (Josh Duhamel). Along with their incestuous group of friends known as "the romantics," (Malin Akerman, Jeremy Strong, Adam Brody, Elijah Wood and Dianna Agron) the feel-good movie will have you believing in the power of true love. What do you think of the trailer?